Jim Britt was one of Boston’s favorite sportscasters, and announced the first baseball games on the new WBZ-TV when it went on the air in 1948. His Boston broadcasting career began on WNAC radio in 1940. At WNAC, he did the play-by-play for the Red Sox games and also hosted “Jim Britt’s Sports Round-Up,” which he continued to do throughout the 1940s. He later worked for WHDH when they became the Red Sox affiliate. On WBZ-TV, he announced both the Braves and the Red Sox games until in 1951. Jim Britt was one of Boston’s favorite sportscasters, and announced the first baseball games on the new WBZ-TV when it went on the air in 1948. His Boston broadcasting career began on WNAC radio in 1940—he came here after doing several years of minor league baseball in Buffalo. At WNAC, he did the play-by-play for the Red Sox games and also hosted “Jim Britt’s Sports Round-Up,” which he continued to do throughout the 1940s. He later worked for WHDH when they became the Red Sox affiliate. On WBZ-TV, he announced both the Braves and the Red Sox games until, in 1951, he was asked to focus exclusively on the Braves, which he did until the Braves moved to Milwaukee in 1953. 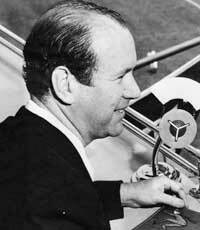 In addition to Britt’s Boston career working at WNAC, WHDH and WBZ-TV, he also announced some nationally televised games, including the All Star game and the World Series in the late 1940s and early 1950s. In addition, Britt distinguished himself for his charitable work for the Jimmy Fund.